When you decide to trim your dog’s nails at home, you’ll need a few supplies. First, you’ll need a pair of nail clippers. Don’t use the same clippers you use on your own nails, but purchase a pair built to accurately cut a dog’s. Dog nail clippers come in different styles and the most common are: guillotine style (these types of clippers are the simplest to use), nail pliers, and scissor. The nail pliers are well-suited to a larger breed dog and the guillotine style is well-suited for small breeds, although, assuming the device is large enough to accommodate the dog’s nail, both types can be accurately used on any sized dog. You will also want a few doggie treats to keep your doggie interested and happy. Before you clip your dog’s nails, show him or her the clippers. Hold the clippers near his or her feet until the dog feels comfortable and is no longer curious. 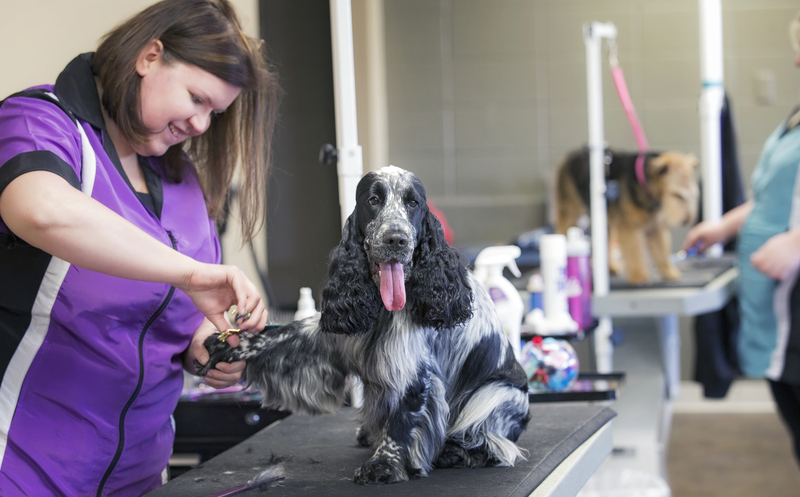 When the dog is ready, take hold of his or her paw and place the clippers over the dead part of the nail. (Some dogs have black nails without a visible delineation of the live and dead part of the nail). The pink part of the nail is full of blood and should never be cut into. With the trimmer, cut the nail quickly and cleanly. If you do nick the live part of the nail, take some tissue paper and apply pressure on the tip of the nail for several minutes. The tip of the nail may bleed, although, with a little pressure (or a clotting powder) it should eventually stop bleeding. If the dog has severe bleeding, or heavy damage to the live part of the nail, he or she should be taken to the vet. Of course, you also have the professional grooming experts at Groomingdales to trim your dog’s nails and keep him or her looking good all year. And if you have any questions about grooming, or need to schedule your dog’s next appointment, then call Groomingdales today.